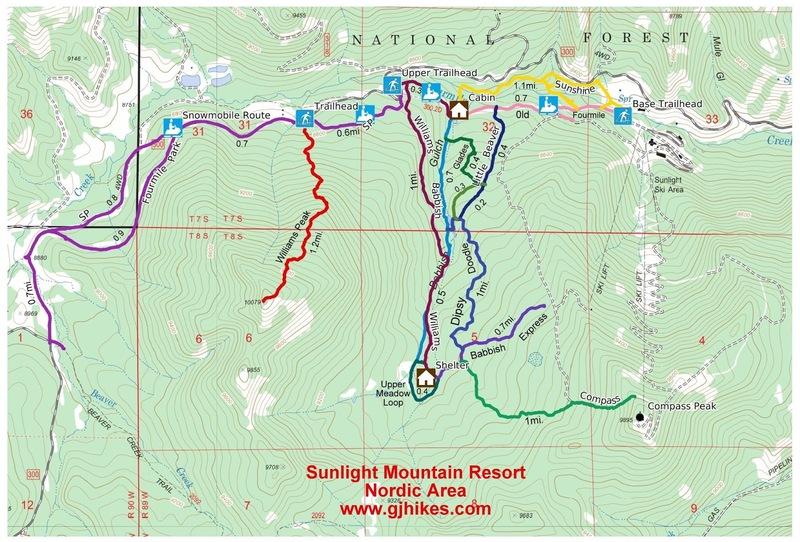 Fourmile Park is located just west of the Sunlight Mountain Resort Nordic area near Glenwood Springs, Colorado. During the winter months the Mt. Sopris Rec. 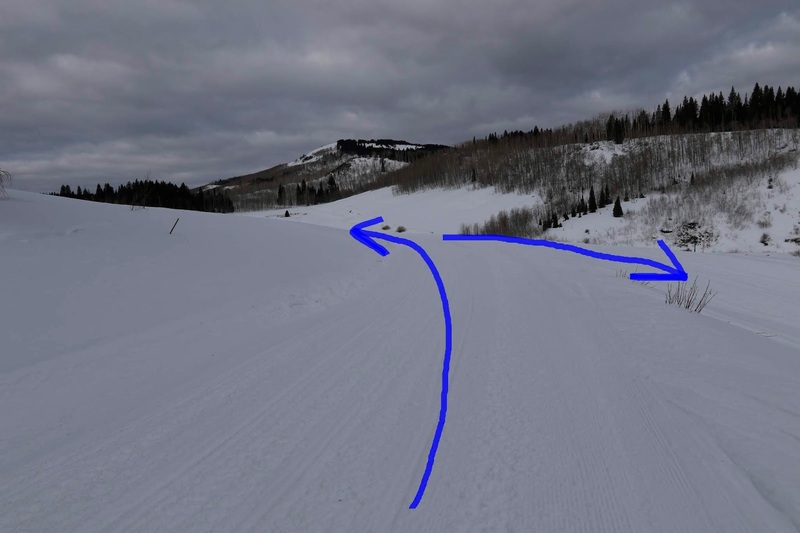 Riders maintain a groomed route called the SP trail that stretches for 120 miles, through 3 National Forests, between the trails on the east end that start at Sunlight Mountain Resort and the trails on the west end on the Grand Mesa. The SP is short for Sunlight to Powderhorn. 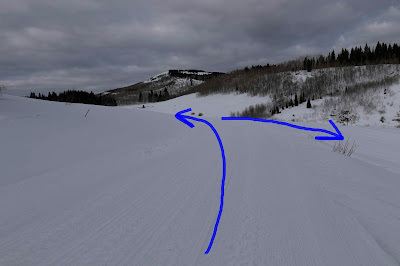 This post covers a short section of the trail on the east end that travels into the Fourmile Park area of the White River National Forest. 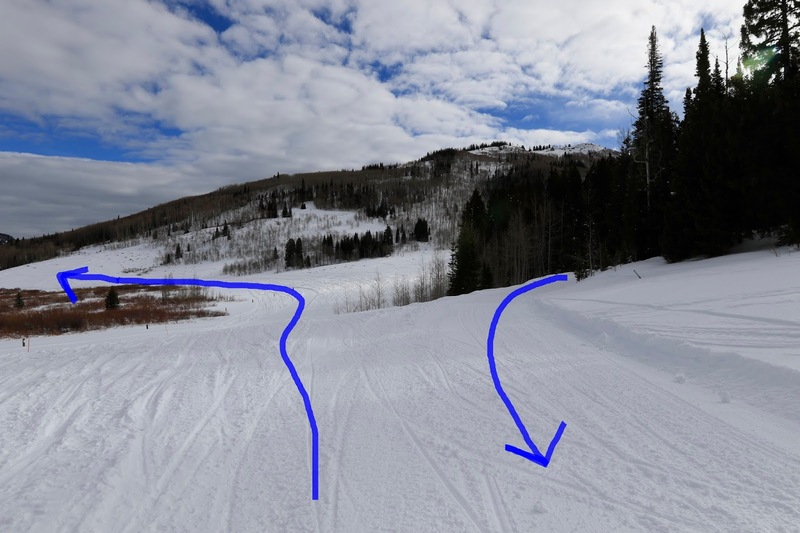 To get to either of the to the two trailheads follow the directions to the Sunlight Mountain Resort Ski Area which is about 10 miles from Glenwood Springs. Just before reaching the base area turn right onto FR #300 at the sign in this photo and head toward Four-Mile Park. The first trailhead is near the 2 mile point of FR #300. This is as far as anyone pulling a trailer can go. Vehicles without trailers can continue for another mile to where the winter maintenance ends. The road is plowed wide enough to park on the right hand side. 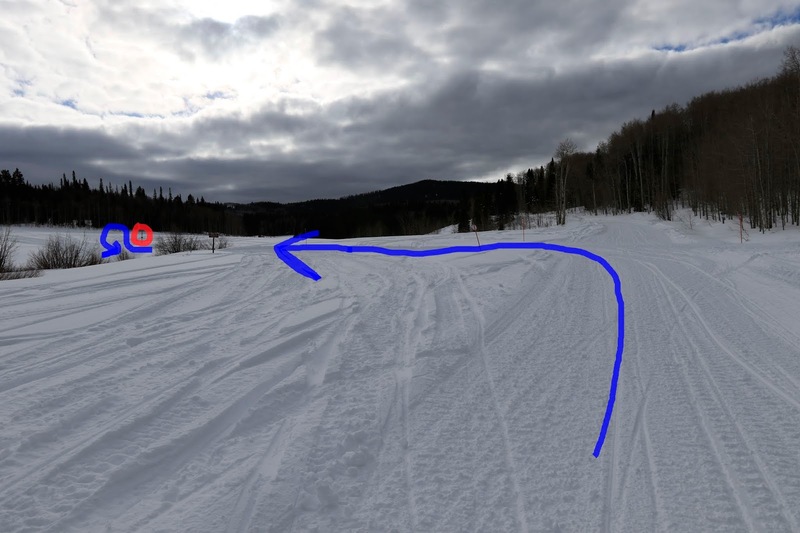 Those that parked down at the 2 mile point can either follow the road up to this point or take another route that is groomed that parallels the road somewhat. 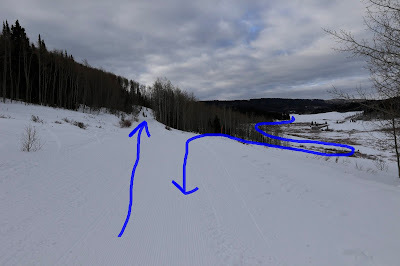 The groomed route has a couple of very steep hills whereas the road is much more moderate. 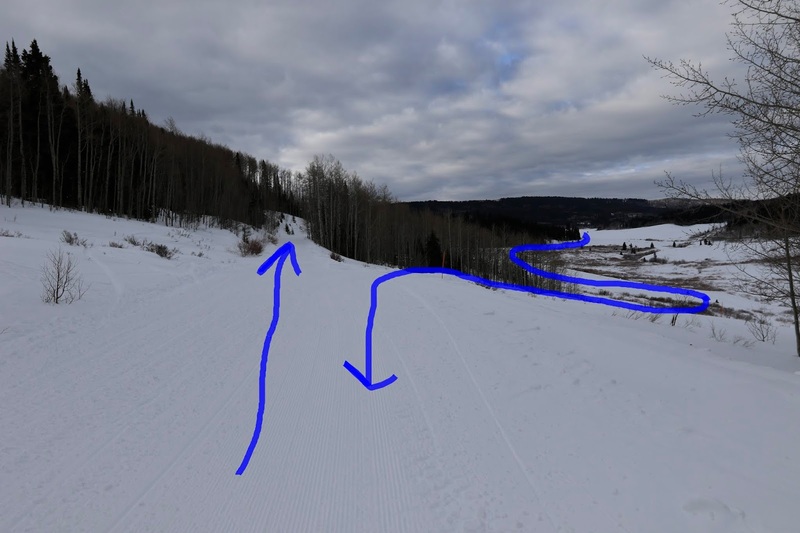 The groomed route merges onto the road at the point where the winter maintenance ends. When we made our second trip toward Fourmile Park the Mt. Sopris Rec. Riders had added a kiosk with some very nice maps on one side and some sign up or donation sheets on the other. For the first mile the trail climbs moderately gaining a couple hundred feet of elevation along the way. It is common to see tracks coming out of the trees on the left side of the road that were made by backcountry skiers that had climbed the Williams Peak trail that begins at the same spot where the winter maintenance ends. From the top of Williams Peak they took various routes down the mountain through the trees and came out onto this trail where they could loop back to their vehicle. Near the 3/4 mile point the SP trail drops off the right side of the road to the valley below. Both routes merge again a little less than a mile from this spot. For this post we stayed up on the groomed route that follows the road for the trip out and came back along the route down in the valley. Unless you are on a snowmobile it is much easier to go in the opposite direction. After the SP trail branches off the route along the road begins a gradual descent and gives back about 100 feet of the elevation that it had gained up to that point. As the trail comes out of the trees and into the open it is rejoined by the SP trail. Our original plans on the day that we took the photos for this post was to go to the right on the SP trail and loop back to the trailhead for a nice loop that would have been just over 3 miles round trip. Instead we decided to keep going around the bend for a better look into Fourmile Park. Once we got around the bend a little we could see one of the Forest Services kiosks up ahead so we decided to keep going so we could check it out. From the kiosk we could see a sign that was another half mile up the trail so we decided to go check it out. Once we got close to it we could see a trailhead marker across the creek from a 4-way intersection so we kept going over to it and as we had guessed it was for the Beaver Creek trail and that is where we finally turned around. This whole area is like one big winter playground with lots of places to explore. On the return trip we branched off onto the SP trail and took the lower route. The trip through the valley along the creek is very pleasant. The only drawback going in this direction is the big hill that you have to climb to get back up to the road. After getting back up to the road it is an easy glide all the way back to the trailhead that is at the end of the winter maintenance. The first time that we came out here we started down at the trailhead where people with trailers have to park and took the alternate route with the steep hills that parallels the road. For this trip we parked at the end of the winter maintenance so that we would have more energy to explore further into Fourmile Park. However you decide to go about it this is an excellent place to spend a winters day. If you would like to see it for yourself then all you have to do is 'Take a hike'.